Glass bottle with metal lid full of Compound Syrup of Cocillana (contains opium, morphine hydrochloride and antimony). 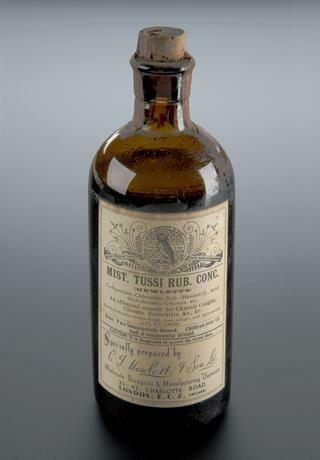 162 mm x 51 mm x 30 mm, 309 g. Label reads, ' Expectorand, Sedative and Tonic Laxative...A soothing rememdy for irritating Coughs, Bronchitis and Chest and Lung troubles.' Produced by Wright, Layman and Umney Limited, early twentieth century. Square glass bottle with cut-glass stopper containing Chlorodyne tablets (morphine hydrochloride, cannabis, nitroglycerine, capsicine and peppermint). 100 mm x 35 mm x 35 mm, 135g. Ferris & Co. Ltd , English, 1893-1900. Rectangular cardboard box containing two cylidrical specimens, each labelled 'Anaesthetic compound'. Burroughs Wellcome and Company Limited, English, c. 1910. Metal box with detachable lid containing 9 ampoules of morphine hydrochloride (0.02g in 1 cc solution). This product dates from around the First World War and is believed to have been manufactured in Germany, possibly for military use. Morphine is powerful analgesic and narcotic but it also has central stimulant actions. The chief uses of morphine are for the relief of pain, the procuring of sleep where sleeplessness is due to pain, the arrest of haemorrhage, the supression of cough and relief of anxiety and apprehension. Amber glass bottle with metal lid full of 'Compound Syrup of Cocillana' (contains cocillana, opium, antimony and morphine hydrochloride). 164 mm x 52 mm x 30 mm, 306 g. By Wright, Layman and Umney Ltd., English, early twentieth century. Yellow metal container with hinged lid and metal bar-clip. Containing two packs of morphine hydrochloride tablets. Each pack of ten tablets is wrapped in paper. Initially this package would have been supplied with more than the two present rolls of tablets. 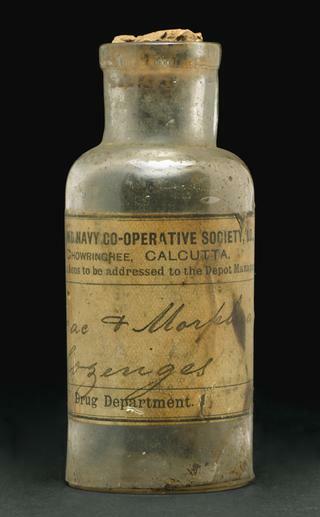 Glass bottle with cork stopper and paper label containing morphine and atropine (possibly liquid for injection). Cardboard box, unopened, with folding lid containing 10 glass ampoules of morphine hydrochloride. Box does not contain a file for de-capping the ampoule. The box is inscribed with the content and manufacturer details and a stamp 'feile im der meaning 'File in Box'. This item was manufactured in Germany during the First World War and is believed to have been issued for military use. Morphine hydrochloride is powerful analgesic and narcotic but it also has central stimulant actions. The uses of morphine are for the relief of pain, the procuring of sleep where sleeplessness is due to pain, the arrest of haemorrhage, the supression of cough and the relief of anxiety and apprehension. Leatherette and velvet lined case for a hypodermic syringe (missing) with three medicament bottles (Ergotine, Apomorphine and Morphine). Overall: 69 mm x 98 mm x 22 mm, 64 g. By Charles Green and Co., London, 1885-1910. Glass ampoule containing morphine hydrochloride (strength 0.02 grammes) (Morfinium Muriatische) in solution for injection. Manufactured in Germany. Believed to be early to mid twentieth century. Morphine hydrochloride is powerful analgesic and but it also has central stimulant actions. The chief uses of morphine are for the relief of pain, the procuring of sleep where sleeplessness is due to pain, the arrest of haemorrhage, the supression of cough and the relief of anxiety and apprehension. 8 cartons of 10 ampoules containing morphine hydrochloride. Wrapped in paper, wrapped in twine (previously cut and retied) and formerly sealed with a green wax seal of the distributor. Inscribed with the contents and have a stamp bearing the legend Army Medical Store 7 Feb 1921' and also possibly 'fifth field medical core [sic]'. Packets inside consist of cardboard box with seperate lid. Internal boxes of morphine are of German manufacture made and dated 1917/18. Morphine hydrochloride is analgesic and narcotic but it also has central stimulant actions. The chief uses of morphine are for the relief of pain, the procuring of sleep where sleeplessness is due to pain, the arrest of haemorrhage, the supression of cough and the relief of and apprehension. Waxed paper envelope to contain unspecified number of geletine lamels impregnated with morphine hydrochloride (lamella morphinae). Manufactured by Savory and Moore, London. Envelope with attached red label, reading 'Morphine Hydr 1/6 gr (0.01 gm) lamel'. Small narrow, clear glass circle based bottled with glass stopper and paper label. Contains morphine hydrochloride (morphiae hydrochloras). Clear glass square based bottle, with glass stopper, and paper label. Originally to contain approximately 2 ounces of solution of morphine hydrochloride. Contents evaporated, though some crystals remain. Clear glass, circle based bottle with cut glass stopper and transfer printed label. Containing unknown quantity of octagonal-shaped morphine lozenges (Trochisci morphinae). Each lozenge is impressed with the legend 'MORPHIA 1/20 GR BP'. Believed to mostly complete. Label reads 'TR. MORPHIA' though this is present over a former inscription 'PULV. MORPHIA' or powdered morphine. Glass bottle originally for Tabloid 'Soda Mint' containing 5 small phials of hypodermic tablets (cocaine hydrochloride, hyoscine hydrobromide, morphine sulphate, strychnine sulphate and digitalin). 80 mm x 20 mm diameter, 13 g. By Burroughs Wellcome and Co., English, 1900-1919. Cardboard box without lid containing 9 ampoules of morphine hydrochloride (morfium hydro-chloricum). This product dates from around the First World War and is believed to have been issued for German military use. Morphine hydrochloride is powerful and narcotic but it also has central stimulant actions. The chief uses of morphine are for the relief of pain, the procuring of sleep where sleeplessness is due to pain, the arrest of haemorrhage, the supression of cough and the relief of anxiety apprehension. Five aluminium tins each of sedative of cough lozenges, each containsing Morphine Hydrochloride and Ipecac. 83 mm x 58 mm x 25 mm, 68 g (each). Savory and Moore crest printed on the tin in red and black lattering. Central label reads, '.../40 SEDATIVE COUGH LOZENGES/DOSE. One when the cough troublesome. Not more than six lozenges a day/.../SAVORY & MOORE, LTD/.../ LONDON.' Manufactured by Savory and Moore Ltd., London, 1945-1960. Brown glass, circle-based, bottle with cork stopper and paper label. To contain approximately 1 ounce of aceto-morphine. 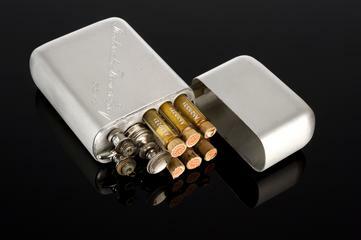 Hypodermic syringe, glass and silver plated brass, in aluminium case, with syringe cleaner and two glass tubes with cork stoppers for Strychnine sulphate and Morphine and Atropine Sulphate (compound) tablets. Case by Allen and Hanburys, London, 1890-1910. Medicaments by Burroughs Wellcome and Co., London. 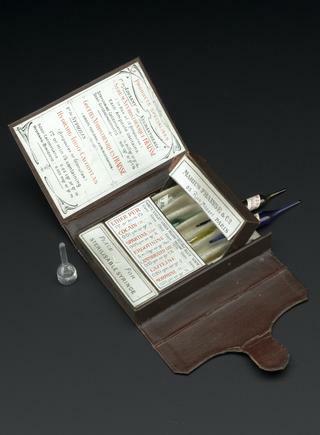 Three ampoules, glass, from set of seven, in cardboard wallet, by Fraisse and Co., 8 rue Jasmin, Paris, France, 1880-1920. 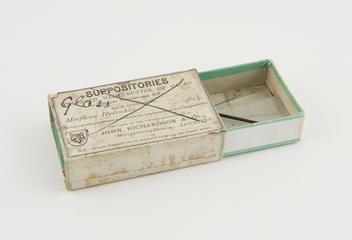 Cardboard box with folding lid containing 10 glass ampoules of morphine hydrochloride. The box is inscribed with the content and manufacturer details and a stamp 'feile im der schachtel' meaning 'File in Box'. This item was manufactured in Germany the First World War and is believed to have been issued for military use. Morphine hydrochloride is powerful analgesic and narcotic but it also has central stimulant actions. The chief uses of morphine are for the relief of pain, the procuring of where sleeplessness is due to pain, the arrest of haemorrhage, the supression of cough and the relief of anxiety and apprehension. Cardboard box, opened, with folding lid containing 9 glass ampoules of morphine hydrochloride. Box does not contain a file for de-capping the ampoule. The box is inscribed with the content and manufacturer details. This item was manufactured in during the First World War and is believed to have been issued for military use. Morphine hydrochloride is powerful analgesic and narcotic but it also has central stimulant actions. The chief uses of morphine are for the relief of pain, the of sleep where sleeplessness is due to pain, the arrest of haemorrhage, the supression of cough and the relief of anxiety and apprehension. Cardboard box, unopened, with folding lid containing 10 glass ampoules of morphine hydrochloride. Box also contains a file for de-capping the ampoule. The box is inscribed with the content and manufacturer details and a stamp 'feile im der meaning 'File in Box'. This item was manufactured in Germany during the First World War and is believed to have been issued for military use. Morphine hydrochloride is powerful analgesic and narcotic but it also has central stimulant actions. The uses of morphine are for the relief of pain, the procuring of sleep where sleeplessness is due to pain, the arrest of haemorrhage, the supression of cough and the relief of anxiety and apprehension. 3 cartons of ampoules (unknown quantity, possibly 10) containing morphine hydrochloride. Wrapped in paper and sealed with a wax seal of the distributor. Inscribed with the contents and have a stamp bearing the legend 'Woolwich Army Medical Store 5 1921' and possibly '7 Field Medical Core(?)[sic]. Possibly a broken ampoule due to staining around box. Morphine hydrochloride is powerful analgesic and narcotic but it also has central stimulant actions. The chief uses of morphine are for the of pain, the procuring of sleep where sleeplessness is due to pain, the arrest of haemorrhage, the supression of cough and the relief of anxiety and apprehension. Cardboard box, opened, with folding lid containing 10 glass ampoules of morphine hydrochloride. Box also contains a file for de-capping the ampoule. A seperate label reads 'Feile im Katschen' meaning 'File in Box'. The box is inscribed with the and manufacturer details. This item was manufactured in Germany during the First World War and is believed to have been issued for military use. Morphine hydrochloride is powerful analgesic and narcotic but it also has central stimulant actions. chief uses of morphine are for the relief of pain, the procuring of sleep where sleeplessness is due to pain, the arrest of haemorrhage, the supression of cough and the relief of anxiety and apprehension.